Hello, and welcome to my web site. 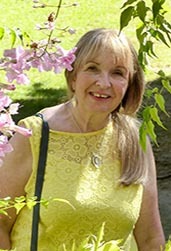 My name is Marie Hines and I have been a Spiritualist Medium & Clairvoyant/Psychic for over 25 years. I live in Paignton, Devon in the sunny(?) south west of England with my husband and 2 sons, and of course the cats. My reputation as a genuine and respected Medium & Clairvoyant has been built up over 25+ years through personal recommendations from past clients. I did not start giving one to one readings until I had studied at my local Spiritualist Church for over 8 years under the tutelage of some of the areas most respected teachers. I have worked as a Medium/Clairvoyant for over 25 years and have demonstrated in many theatres, halls, hotels and churches throughout the South West of England, and have had clients contact me from as far away as Australia. I have also appeared on local radio where I have given proof of survival and advice to phone in listeners with the help of my spirit guide. I have run closed circles in my home to help others to develop their gifts. I have also done many Psychic Fairs around the country and postal readings (no longer available) for those that cannot attend personally. I have also investigated many hauntings where I have been asked for help within clients homes. Please browse through my site and if you would like to contact me please do. I would also be very pleased to see you at any of my services or demonstrations.